Song, music & other oral transmissions are preserved and transmitted in a variety of ways, including recordings and songbooks. This photograph depicts a Uher 4000 Report Reel-to-Reel Recorder and a stack of Newfoundland song collections. Folksong in Newfoundland owes a great deal to the people of Irish descent. They have a genius for music and learn not only the Irish songs, but any other lovely airs they hear, and they render them most sweetly. I am inclined to credit the Irish with a large share in keeping the Newfoundland folk-music so melodious. It’s tempting to explain the rich repertoire of the Cape Shore as a link to Ireland’s pre-famine past. Songs about 1798 and Napoleon. Stories that have disappeared from the living tradition in Ireland. And laments about forced migration. These, and other, themes make it easy to imagine the communities of outport Newfoundland as repositories of unspoiled Old World oral traditions. These connections exist, but the tale is more complicated. Singers also have songs about local events, shipwrecks, and popular American tunes. Repertoires have been thoroughly localised and reflect the trials, tribulations, and joys of the generations who have lived, worked, and emigrated from the outports. Excerpts from an ITMA interview with Aidan O’Hara. Aidan describes the repertoires of some of the singers he recorded on the Cape Shore and their sources for songs. When Aidan O’Hara made his collecting trips to the Cape Shore during the 1970s there was only a rough dirt road leading around the shore of the peninsula. The people who lived there were isolated, dependant on fishing and small-scale farming for survival. Many houses on the Cape Shore lacked access to electricity and phones until well into the 20th century—electricity reached much of the Cape Shore in 1964, less than ten years before Aidan O’Hara made his first visit to the area. Songs often were prefaced with explanations of where they came from. Sometimes Aidan O’Hara was told “this is an old song” learned from a parent or neighbour who died in near the turn of the 20th century. The “old people” had few other sources of entertainment, so they sang. In equal measure, he was told that the songs were learned from records, radios, and song book. By the time Aidan O’Hara arrived on the Shore, televisions were also important sources of new repertoire. Throughout the 20th century, published songsters, tune books, and collections have helped shape the repertoires of Newfoundlanders—including the songs sung by the people of the Cape Shore. Henry Campbell and Emma McGrath Doyle, for example, were both from Branch and were both known for having the words to old ballads that others in the area had forgotten. Both mentioned learning at least some of their songs from songbooks. And people like Caroline Brennan, for example, wrote down songs to create her own collection, publishing words for songs of she deemed of significance from time to time in a local newsletter: New Horizons, published by the Cape Shore Area Senior Citizens Association. Caroline Brennan wrote down the words to many of her songs to ensure that she remembered them correctly. She shared this copy of “Wait till my ship comes in” with Aidan O’Hara. Jack was a sailor, song (Jack was a sailor on board of a whaler …) A handwritten transcript of 'Jack was a sailor onboard a whaler.' The source of the transcript is not specified. This may have come from Caroline Brennan; in several of Aidan O'Hara's field recordings Caroline promises to write out the words for her songs. The practice of sharing songs in print was well-established by the early 20th century in Newfoundland. Ballad sheets and songsters published by the likes of Johnny Burke (1851–1930) and Gerald S Doyle (1892–1956) were frequently available in outport homes. In fact, including a song in one of the freely circulated Doyle songbooks was virtually synonymous with canonisation. Newfoundland was a place that fascinated professional song collectors. The first generation of these collectors—people like Elisabeth Greenleaf, Grace Mansfield, and Maud Karpeles—travelled to Newfoundland during the 1920s and transcribed the songs that they heard on the spot. Subsequent generations, beginning with MacEdward Leach and Kenneth Peacock, relied on reel-to-reel recordings to document the songs that they later painstakingly transcribed and published. The choices these and other collectors made about which songs to record, which versions to publish, and how to reconstruct fragments into songs have left lasting marks on how repertoire is understood outside of Newfoundland, but also on the songs that are sung within Newfoundland. Singer and folklorist Anita Best is just one of the people who visited the Cape Shore to learn songs from John Joe English. Some of the results of these visits are published in Come and I Will Sing You: A Newfoundland Songbook (1985). 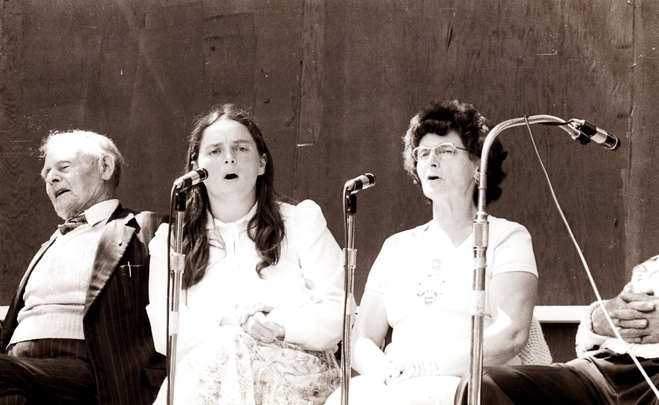 Anita Best and her mother Elsie Best sing at the Newfoundland Folk Festival. A good example of the influence of collectors is found in the song, “She’s like the swallow.” In a 2007 article published in Newfoundland and Labrador Studies, folklorist Neil V Rosenburg traces the history of this iconic song. British song collector Maud Karpeles first transcribed “She’s like the swallow” during her 1930 visit to Newfoundland. Her version, and the setting crafted by composer Ralph Vaughan Williams (1872–1958), had a profound impact. Recordings cemented the melody and lyrics for subsequent generations—particularly as popular folk singers like Alan Mills and Omar Blondahl recorded and broadcast the Karpeles version in Newfoundland and across Canada. Karpeles’ setting of the song also encouraged other collectors, most notably Kenneth Peacock, to seek out other versions in the hopes of recovering other verses. Though now understood as a quintessential Newfoundland song, it’s not clear that it was particularly well-known amongst Newfoundlanders before the interventions of collectors. Johnny Burke at the St John’s Regatta in 1903 (photo from The Newfoundland Quarterly 3(2), September 1903:4; public domain). A businessman and folksong collector, Gerald S Doyle (and his descendants) published five editions of his song book, all freely available. The booklets contained songs that he collected during visits to Newfoundland’s remote outport communities—and lots of advertising for his St John’s based business interests. Doyle’s booklets not only circulated amongst Newfoundlanders, they also spread to other parts of North America. They were taken home as souvenirs by American servicemen stationed in Newfoundland during the Second World War and incorporated into The Folksongs of Canada (1954) by Edith Fowke and Richard Dawson, a songbook that appeared in schools throughout Canada for much of the 20th century. The ‘Doyle’ songs, often frolicking and upbeat in nature, consequently formed a canon of Newfoundland folk song. Elisabeth Greenleaf first came to Newfoundland in 1920 as a volunteer teacher with the Grenfell Mission (an organisation that provided social services and support to the communities of northern Newfoundland and Labrador). She first heard traditional Newfoundland song while stationed near Bonne Bay in western Newfoundland. With the support of Vassar College, a private liberal arts college in New York State, she returned to Newfoundland in the company of musicologist Grace Yarrow Mansfield in 1929. The results of their collecting efforts were published as The Ballads and Sea Songs of Newfoundland (1933). This book is considered the first academic study of Newfoundland traditional song. British collector Maud Karpeles made two separate trips to Newfoundland in 1929 and 1930, approximately contemporary with the collecting trips made by Greenleaf and Mansfield. The trip had originally been planned by Cecil Sharpe, who believed that Newfoundland, Britain’s oldest colony, must surely be a repository for folksongs of English origin. Karpeles completed the collecting trip after Sharpe’s death. Though she travelled as far west as Notre Dame Bay on Newfoundland’s northern shore, most of Karpeles’ collecting focused on the coastline between Bonavista Bay and Fortune Bay on the Southern Shore. Karpeles collected more than 200 songs and dances from approximately 104 singers (Guigné 2016:5), though the scope of her project was limited by her exclusive interest in British folk songs. After returning to Britain, she initially published a small number of the songs in a two volume collection with piano accompaniments. Almost 40 years later she released a collection of 150 songs, with melodies and words only. 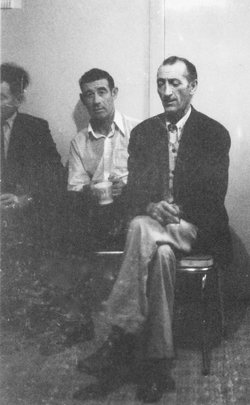 Considered one of the most influential North American folklorists of the 20th century, MacEdward Leach was a professor at the University of Pennsylvania—the university where Kenneth S Goldstein completed his doctorate (Goldstein accompanied Aidan O’Hara on a joint collecting trip around the Cape Shore in 1978). Leach made four collecting trips to Atlantic Canada between 1950 and 1960. His Folk Ballads & Songs of the Lower Labrador Coast (1965) derives from his 1960 trip to the Labrador Coast. The Ballad Book (1955), Leach’s magnum opus, was certainly influenced by his collecting work in Newfoundland though it is constructed as a history and account of English-language balladry (rather than an account of ballads sung in a particular region). Between 1951 and 1961, Peacock collected 766 songs from singers in 38 communities and including examples of the province’s anglophone, francophone, and Scottish traditions—all with the aim of “building up the National Museum of Canada’s archival collections” (Guigné 2016:2). Many of those songs are published in the three-volume series, Songs of the Newfoundland Outports. Peacock’s collection is highly regarded by singers of Newfoundland song, and well noted by many researchers for its breadth and scope. John Joe English exerted his most enduring influence from his kitchen. Collectors, folklorists, and broadcasters (including Aidan O’Hara) came from far and near to hear, learn, and record John Joe. These song aficionados and collectors weren’t the only people to documenting Newfoundland’s song traditions during the 20th century—and they certainly weren’t the last. People like Aidan O’Hara came next. And over the following two decades, Kenneth S Goldstein collected and collaborated with folklorists at Memorial University, eventually compiling recordings of approximately 3,250 songs. The road to Cuslett. When Aidan O’Hara visited the Cape Shore during the 1970s, this was the only route in and out. The local song is much more significant for understanding the function of folk song in a community than is an infrequently sung or little known older ballad, no matter how much more satisfying the rare ballad may be to our aesthetic sensibilities, or our egos. Aidan O’Hara’s recordings of the Cape Shore reveal a richly varied tradition. While repertories recalled Irish roots, they also reflected local conditions. There are many songs about the sea, for example, reflecting the importance of waterways in the lives of residents. The Cape Shore may have been settled by farmers, but the emphasis shifted to the fisheries in subsequent generations. The uncertainty of lives spent at sea is reflected in local repertories. Ballads relating local tragedies circulate alongside songs about events in far off places. And the seriousness of tales of tragedy and loss is offset by comedic songs and ditties. The northeast gale, song (Ye hardy sons of Newfoundland pay attention to my song ...) Composed by Walt Young, this song tells the story of a gale that arose off the coast of Newfoundland on 18 June 1906. Several fishing craft from Placentia Bay that were fishing off Cape St Mary’s were caught in the storm and men were lost at sea. The drunken captain, song (In the stream of cancer [Strait of Canso] our good ship lay …) This song is usually known as “The drunken captain” in Newfoundland. Dermot Roche’s version closely resembles a variant titled “In Canso Strait” that more typically is associated with Nova Scotia origins. In both cases, the song tells the story of a ship’s captain who drinks too much and endangers his crew with his poor judgement. 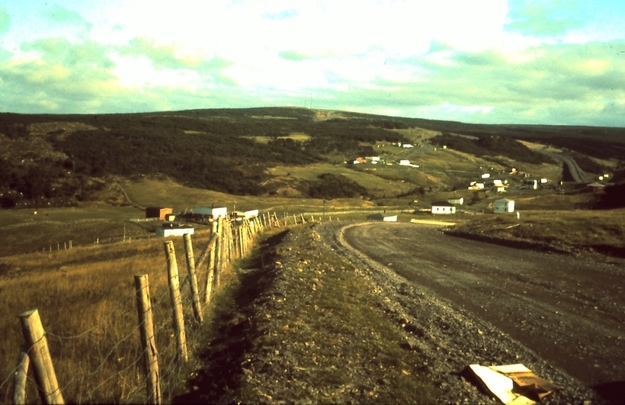 See Genevieve Lehr’s Come and I Will Sing You (1985:53–3) and Kenneth Peacock’s Songs of the Newfoundland Outports 3 (1965:871–2) for other versions of this song collected in Newfoundland. Jack was a sailor on board a whaler, song (Jack was a sailor on board of a whaler ...) This children’s son features a sailor named Jack. A friend asks him to pay a debt, and Jack responds, “You’ll have to wait till my ship comes in.” When Jack later survives a shipwreck and his friend makes the same demand, Jack gives the same excuse. Though the song follows a standard verse-and-refrain form, the metric structure of the song is somewhat unusual: verses are sung in triple metre and choruses are in duple metre, matching shifts in the narration from third to first person. There were songs that told stories about local incidents and songs reflecting on sectarian tensions in 19th century Newfoundland. And there were songs to break the tension when times were hard. Songs came from a variety of places. Some were local compositions reflecting local conditions. But some reflected the fact that traditional industries—like farming and fishing—weren’t adequate for sustaining families. Like their Irish ancestors who travelled to the Cape Shore during the 18th century, seasonal migration for work was necessary. Newfoundlanders’ travels brought them into contact with more recent Irish immigrants, Americans, and Canadians, and the musics, cultures, and technologies of the 20th century. This song laments the necessity of leaving Newfoundland to seek work on the mainland, and offers commentary on the political and economic conditions forcing migration. The emigrant from Newfoundland, song (Dear Newfoundland, have I got to leave you …) This song may have been composed by JT Kinsella when he emigrated from Newfoundland to settle in Boston, Massachusetts. It laments the necessity of leaving Newfoundland to seek work on the mainland, in this case Boston. The song offers commentary on Confederation with Canada and includes reminiscences of favourite events and places in the St John’s area. The song was published as early as 1904 in St John’s under the title “The Newfoundland exile” in James Murphy’s Old Colony Song Book. Details about the history of this song are available from the GEST song index. Variants have been published by Kenneth Peacock in the Songs of the Newfoundland Outports 2 (1965:360–61) and by MacEdward Leach. Men left the Cape Shore to work in the lumberwoods—the lumber industry—of Newfoundland’s west coast. They looked for opportunities in the capital city of St John’s. They sought construction work in the big American cities of the eastern seaboard—Boston, New York—places that traditionally were linked to Newfoundland through trade routes. And, especially after Newfoundland joined Canada in 1949 through a process called Confederation, they went to capital cities like Montreal or Toronto, or sought opportunities in western Canada. A song about the conditions found in the work camps in western Newfoundland. Stan McGrath learned “The days of the week” while working in the lumberwoods near Bishop Falls. The days of the week, song (On Monday morning as I roved out …) Also known as “A week’s matrimony” or “The woeful marriage,” this comic broadside ballad tells the story of a whirlwind courtship and marriage that ends in violence and mental instability. Stan McGrath learned this song while working away from the Cape Shore in the lumberwoods. Some of the men found work closer to home. During the 1940s, an American military base opened in Argentia—just to the north of Placentia. John Joe English put his skills in blueprinting and estimating to use when the base was being built. Denis McGrath walked approximately 20 miles from Patrick’s Cove every Sunday evening to spend the week working at the base. Argentia was an important employer in the region. But it was also a source for new music and songs. One-to-one exchanges with military men stationed at Argentia were one means of getting new songs. But so was armed forces radio. It’s impossible to determine the exact origin of many of the songs included in A Grand Time. But perhaps American songs like “The cottage by the sea” (recorded by Roy Harvey in 1930 for Columbia) or “The gambling man” (recorded by Kelly Harrel in 1925 for Victor) made their way into the repertories of Cape Shore singers via the military base. The cottage by the sea, song (To a little seaside village came a youth one summer's day …) Jack Mooney learned this song from his mother, Esther (Careen) Mooney, who was originally from Point Lance, Newfoundland. This song tells the story of a young man who visits a seaside village. He engages in what he thinks is a harmless flirtation with a local woman, leaving her at the end of the summer. He returns a year later when he realises that he loves her, but discovers that she has died of a broken heart. This song was recorded as “Just goodbye I am going home,” by American old-time singer-songwriter Roy Harvey on 9 September 1930 (Columbia 15609-D). Equally, these songs may have arrived on the Cape Shore records or radio broadcasts. 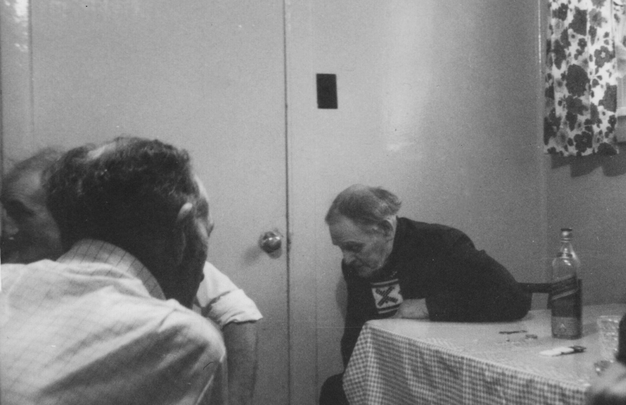 In his regional discography of Newfoundland music, folklorist Michael Taft notes that from about 1930 on, record players were commonly found in many outport homes in Newfoundland. Record players were becoming more and more prevalent, both in St John’s and in the outport villages, and the ordering of records by mail from the mainland became quite common. It would not be surprising to find a Jimmie Rodgers or Hank Snow record in the possession of an outport family (of perhaps better than average income) by the late 1930s. Henry Nash, who grew up in Ship Cove, owned an impressive collection of 78s, many of which reflected a strong interest in Irish and Irish-American performers. Among others, recordings of The McNulty Family, Myles O’Malley and his orchestra, John McGettigan and his Irish Minstrels, Rudy Vallee and his Connecticut Yankees, Dan Sullivan’s Shamrock Band, and Mattie Toohey’s Irish Minstrels were all available on the Cape Shore by the 1970s. Other people, like Albert Roche, told Aidan about the importance of the radio for getting new songs. There was a fine art to tuning in with an old radio. If conditions were right, it was possible to pick up a signal from Boston. There was an Irish hour that was a particularly good source of songs. By listening carefully it was possible to pick up the air of a tune, and some of the people on the Cape Shore had shorthand so they could take down the words. Albert Roche and Gerald Campbell roomed together when they went away to work in Labrador. They sang and composed songs to pass the time, including Albert Roche's song, "The track to Knob Lake." Eugene Mooney, the son of Jack Mooney, recalls that his father’s generation listened faithfully to their favourite radio programmes, week after week trying to hear the same songs for a second or third time. Sometimes static on the radio meant a word would be missed, or sometimes the song wasn’t heard again for a long time. That, Eugene says, is one of the reasons why the Cape Shore versions of songs are often unique. Singers would insert their own words to fill in the blanks in their memories or gaps left by poor radio receptions. Sometimes the result was a logical recrafting of the lyrics. Sometimes nonsense words were handy substitutions that took on a life of their own (Eugene Mooney to Rebecca Draisey-Collishaw, telephone conversation, 19 January 2018). The songs, music, and oral traditions that Aidan O’Hara recorded on the Cape Shore demonstrate the complex ways in which culture is passed down and evolved to suit local circumstances. While some songs reveal connections to pre-Famine Ireland, others demonstrate the influence ongoing cycles of migration, local preoccupations, and changing access to technology throughout the 20th century.